Satellite imagery from June 21, 2012 that ISIS has obtained from Digital Globe shows that suspected sanitization activity at the Parchin site has continued to progress. This site is where Iran is suspected to have conducted high explosive tests pertinent to the manufacturing of nuclear weapons. The International Atomic Energy Agency (IAEA) deserves international backing in support of its efforts to gain access to this site. The IAEA needs to do so in order to fulfill its obligation to determine both the correctness and completeness of Iran’s declaration under its traditional safeguards agreement and carry out its responsibilities under U.N. Security Council resolutions on Iran. The IAEA Board of Governors in 1992 affirmed and in 1995 reaffirmed that the IAEA has the right and obligation not only to verify that State declarations of nuclear material subject to traditional safeguards are correct, but that they are also complete. Safeguards were developed to provide assurances required by the states that are parties to the Nuclear Non-Proliferation Treaty, specifically that there is no diversion of nuclear material outside of proscribed purposes. In order to do that, the IAEA has to look beyond that what is declared. The IAEA can justify its request for access to locations on the basis that it has credible evidence there are undeclared activities being carried out. It can seek access if it believes such access will contribute to the fulfillment of its mandate–making sure there is no diversion of nuclear material. If Iran carried out what the IAEA suspects is nuclear weaponization activities at the Parchin site, then the IAEA necessarily has doubts about whether Iran has declared all of the nuclear material, facilities, and activities which it is required to declare under its traditional safeguards agreement. If Iran does not allow the IAEA access to the Parchin site, the IAEA’s Board of Governors needs to consider this matter at its September 2012 meeting. 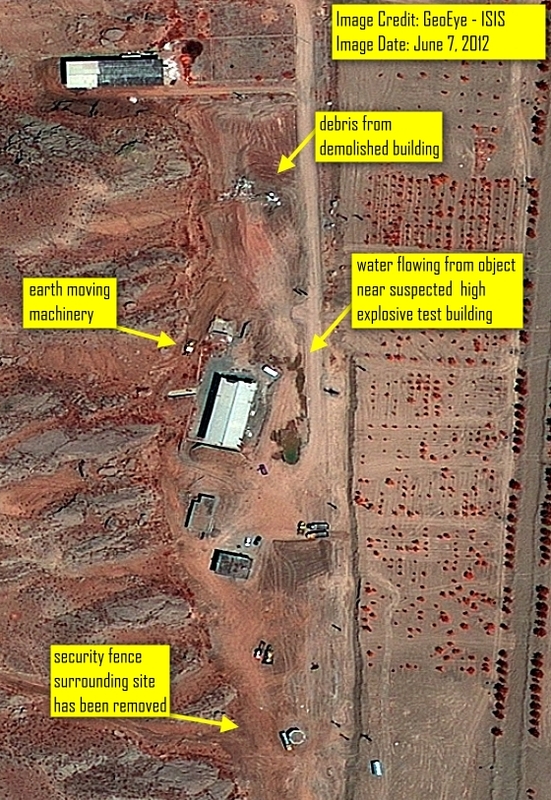 Iran’s ongoing activities at the Parchin site continue to raise concerns about efforts to destroy evidence of possible nuclear weapons-related work. Since the last image ISIS provided on June 7, 2012 several activities have taken place. Debris from one of the previously demolished buildings located just north of the explosives testing building appears to have been removed from the site (figure 1). The layout of the site has been heavily altered by earth displacement, and there is no remaining trace of one of the previously demolished buildings or the roads within the complex perimeter. An object that was previously placed near the alleged explosive chamber building and was suspected to be the origin of the water flow in the June 7 satellite imagery has now been moved to a nearby building just south of the testing chamber structure. Once again, traces of water flow are visible (figure 1). This suggests the object may be a water tank and is being moved around the site, possibly to clean the buildings. The area around the northernmost building on the site (as identified by a common perimeter in figure 3) that was previously unchanged now shows evidence of new earth movement since the June 7 image. A clearly visible geometrical layout to the right of the building (see figures 2 and 3) is no longer recognizable suggesting earth displacement or heavy machinery activity. Since the first signs of a possible clean up at Parchin emerged in the April 9, 2012 satellite imagery (figure 3), the site containing the suspect activity has undergone very noticeable changes with two buildings demolished, excavation of earth including most of the surrounding vegetation and roads covered or removed, dismantlement of the security perimeter around the site, and evidence of water usage potentially for cleaning the insides of buildings. As ISIS has previously noted, water could be used as part of a process to attempt to wash out radiological evidence from hydrodynamic testing which used natural uranium metal as a surrogate material for highly enriched uranium. The process could involve grinding down the surfaces inside the building, collecting the dust and then washing the area thoroughly. This could be followed with use of new building materials and paint. Washing alone runs the risk of contaminating the wider area outside. Removal of the surrounding, contaminated earth suggests recognition of the need to remove the layer of soil that was contaminated by water runoff. Some have raised the possibility that, if the explosive chamber had been used to test a neutron initiator, this type of test would leave behind a radioactive signature in the steel. According to Süddeutsche Zeitung, the chamber could have been used to test a uranium deuteride initiator at the center of a sphere of tungsten used as a surrogate material, all of which would have been compressed by high explosives. If successful, the resulting fusion of deuterium would have produced a small spurt of neutrons. In this case, a tiny fraction of these neutrons would have activated elements in the steel chamber. This has led to the question whether the induced radiation could now be detected by the IAEA. However, in such a neutron initiator test, the number of neutrons is very small and many of the activated materials would have had relatively short half-lives. Although long lived radionuclides should have been produced in such a test, they would exist in very small quantities. Claims that such radioactive materials would be easily detectable today appear doubtful. Moreover, the detection of minute amounts of long-lived radionuclides in the steel chamber may not provide definitive proof of an initiator test. Iran could claim that the steel was already contaminated when it purchased it. In addition, Iran could have removed the chamber altogether, preventing any risk of such detection, even if it were possible to accomplish. In the past, Iran cleaned up sites in attempts to defeat IAEA discovery of its activities. The inspectors managed to establish hidden activities in some but not all cases. Extensive demolishment and cleanup of sites can prevent the IAEA from detecting hidden activities through the application of its analytical capabilities, such as environmental sampling. It is difficult to predict how the IAEA would do in the case that it gains access to Parchin. Iran should immediately halt any further work at this site, grant the inspectors access to it, and cooperate so that the IAEA can conduct a thorough investigation of this site. Otherwise, the next IAEA Board of Governors meeting should condemn Iran’s activities at Parchin as thwarting a legitimate IAEA request aimed at answering the fundamental issue of whether Iran’s nuclear declaration is complete. Figure 1. Most recent Digital Globe image from June 21, 2012 of the Parchin explosives testing site shows the highly altered layout of the site including fresh earth displacement near the northernmost building. Figure 2. In this GeoEye image from June 7, 2012 the debris from one of the demolished buildings is still visible. Water flowing from an object nearby the alleged explosives testing building is also evident as is the removal of the security perimeter that previously surrounded the site. Figure 3. 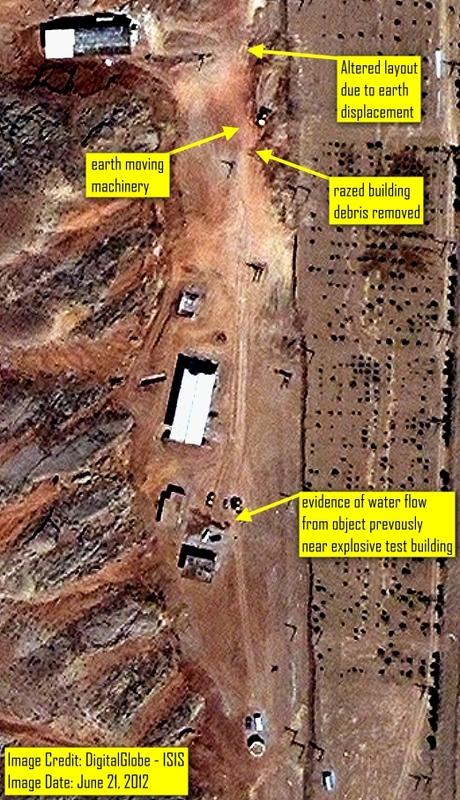 April 9, 2012 imagery showing the first traces of suspected clean up activity at the Parchin site. No noticeable earth displacement activities had taken place at this date and the unaltered layout of the site is clearly visible with roads, vegetation, and the two buildings that were later demolished.